"We have a duty to advocate for equality and fundamental human rights for everyone everywhere. Our beautiful corner of the world can provide support and strength and a blue print to implement improved laws for LGBTQ people around the globe." 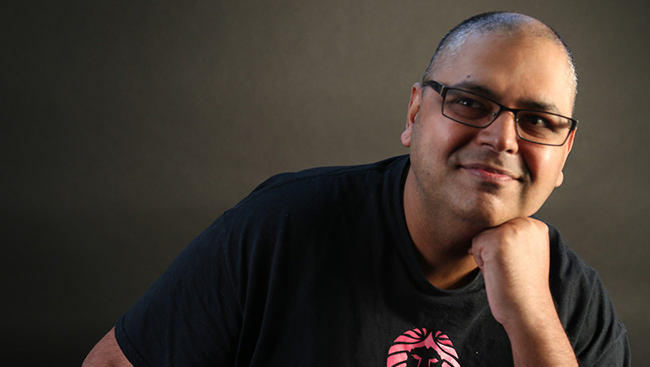 Alex Sangha, an award-winning author, social worker, and advocate for equality and human rights, is the founder of Sher Vancouver – a social, cultural, and support group for LGBTQ South Asians. In terms of his LGBTQ advocacy, Sangha was elected Co-Chair of Pride UBC. He was involved with the Gay Warriors talking circle and was elected Secretary on the Board of the Four Feathers Society.He is currently working to advance LGBTQ programs and services within Fraser Health Authority. Sangha is the recipient of the Queen’s Diamond Jubilee Medal for Social Work and is the Grand Marshall of the 2016 Vancouver Pride Parade. I am an author, social worker, and advocate for equality and human rights, and have worked as an instructor, clinician, counsellor, case manager, social worker, and youth counsellor. I currently work as a team leader for a mental health team with a health authority. In addition, I have a thriving side counselling practice in North Delta where the majority of my clients are Punjabi-speaking or South Asian. I have obtained my Registered Clinical Social Worker (RCSW) designation which is the highest clinical designation in social work in B.C. I have been a columnist or contributor for the Surrey Leader, Vancouver Observer, Georgia Straight, and Times of India. My social discussion book, Catalyst, was a finalist in the Next Generation Indie Book Awards 2014. 2. You are the founder of Sher Vancouver and Dosti Project. Do talk about these organizations/ programmes and the work involved. Sher Vancouver is a social, cultural, and support organization for Lesbian, Gay, Bisexual, Transgender Queer (LGBTQ) South Asians and friends. It is affiliated with the Progressive Intercultural Community Services (PICS) Society thanks in large part to the personal support of Charan Gill for our work. Sher provides advocacy, counselling, information, referral, peer support, social activities, volunteer opportunities, and outreach presentations to combat racism, bullying, and other forms of discrimination. The mandate of Sher is to reduce the alienation, isolation, loneliness, depression, and suicidal ideation of our members. We want to create safe spaces where people can seek support and help to deal with sexuality and gender issues. It is my motto that we must all love ourselves, enjoy our lives, and help others. We are all one people; united we stand and divided we fall. It is the duty of Sikhs to support the marginalized and oppressed. We know what it is like to be the victims of discrimination. We have a duty to help and support others who are vulnerable including sexual and gender minorities. Dosti, meaning “friendship,” is an anti-bullying project from a LGBTQ and South Asian perspective. Sher sent young adults into high schools in Surrey, Delta, Langley, and Vancouver to share our coming-out stories and some of the challenges we face growing up as gay and brown. These workshops were really an eye-opening experience for many South Asian youth. For many, it was the first time they have ever met a gay brown person. Sher feels it’s important for gay brown people to have support from their peers to come out. Many gay South Asians are forced into marriages and live double lives. This is harmful to both husband and wife as both partners are deprived of a loving healthy relationship that is natural for them. 3. You are the Grand Marshall of the 2016 Vancouver Pride Parade. Do talk about the upcoming pride parade and your role in it as Grand Marshall. I was selected as a Grand Marshall in the Role Model category; I feel very honoured and blessed. Someone told me that I might be the first Sikh that has ever been a Grand Marshall of any major pride parade in a big city. The Vancouver Pride Parade is one of the largest in North America and has hundreds of thousands of people who come out to show their solidarity. People from all backgrounds, gay and straight alike, are welcome to attend and show their support. I feel we can all be “role models.” We can set an example for other countries. In India and many parts of the world, homosexuality is illegal and our LGBTQ friends are persecuted if not executed in some countries. We have a duty to advocate for equality and fundamental human rights for everyone everywhere. Our beautiful corner of the world can provide support and strength and a blue print to implement improved laws for LGBTQ people around the globe. 4. The First Annual Surrey Pride Parade recently took place. How was the response towards it? The parade was amazing, there was atleast 1,000 people there. The parade is a good sign that Surrey is becoming a diverse and cosmopolitan city. More and more will come out to the parade every year. Sher Vancouver was proud to be a part of the first Surrey Pride Parade. The Sher contingent was atleast 25 to 30 people strong. Sher will continue to attend Surrey Pride and represent our community. 5. The recent Orlando shooting has got the LBGT society in the news. What was your reaction towards this incident? I was deeply saddened by this news. Almost 50 innocent young people were gunned down; many of them were people of colour. Their lives and potential bright futures were taken from them. It seems obvious to me that the killer was confused and had many issues to deal with. However, the actions of one person should not stereotype an entire community. It is important for the South Asian community to condemn these actions to prevent a societal backlash. The South Asian community at large is vulnerable. We are a minority group; we are also targeted. We can also be victims of oppressive laws and policies. US Republican Presidential Candidate Donald Trump has been wiping up a backlash against Muslim immigrants. It is not far fetched to think that the same can happen to Sikhs or any other minority group including gays and lesbians. We must stand in solidarity and support each other especially during tragic times like these. 6. How has this incident impacted the LGBT community here? This incident could have happened in Vancouver. Anyone can walk into a gay bar and kill members of the LGBTQ community. If we don’t condemn these actions then we condone it and it in effect gives permission for others to do the same thing. Society needs to say enough is enough. This type of violence is not acceptable in any civilized society. You have a right to voice your disagreement with us or who we are but you do not have a right to take our lives and that of our youth. 7. How welcoming is Vancouver towards the queer community? What initiatives have been planned for its members? Vancouver is very welcoming towards the LGBTQ community. Sometimes it’s difficult for visible minorities to fit into the larger LGBTQ community because of cultural and social reasons but that is exactly why Sher Vancouver exists. We have grown to over 600 members know. Sher Vancouver is planning a documentary about our late social coordinator, January Marie Lapuz, who was a transwoman of colour. She was also a victim of violence and died. Sher Vancouver is hosting regular social events and activities. I recommend interested people join our official Facebook group and page for details. 8. Do you think people are more understanding or receptive towards LGBTs after the incident? Every community has homophobic and transphobic people. I feel it’s due to a lack of understanding and ignorance. Once you meet LGBTQ people and have them as friends then you’re less likely to hate them. Some gay people even suffer from internalized homophobia which means they do not like themselves for being gay, which is very sad. It is my hope that everyone is true to their sexual and gender identity and can be proud of who they are and live the life they were created to live in peace and happiness. 9. What are your future plans with regards to the growth and development of the LBGT community? My future plans are to continue to host regular social events for peer support and provide an outlet for LGBTQ South Asians to find support. If we can save even one life then we are doing a great service for the community. If you know of a LGBTQ South Asian person who is struggling and needs help, please have them get in touch with myself or Sher Vancouver. LGBTQ youth are at high risk of suicide, depression, addiction, and even homelessness due to abandonment or rejection from their parents. We in the South Asian community must respond to ensure none of our LGBTQ youth have to suffer in such a circumstance. 10. Is there any message you would like to give readers to better understand the LGBTs? My message is that we are all brothers and sisters. We come from a common origin and we are all a part of humanity. We need to start treating each other like family and this means to support and love each other. Love and unity will prevail over hate. Manjot S. Hallen, co-founder of Vancouver-based law firm Warnett Hallen LLP, is the President of the Liberal Party of Canada in British Columbia. 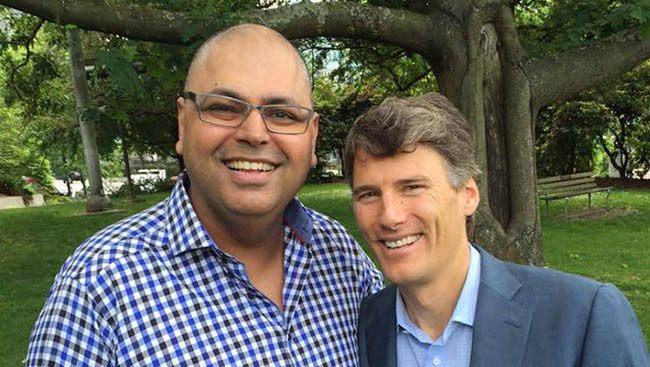 Recently elected in March, Hallen is the first Indo-Canadian to become the Liberal Party’s president in British Columbia. Honourable Minister Harjit Singh Sajjan is the current Minister of National Defence and a Member of Parliament representing the riding of Vancouver South. Sajjan was first elected during the 2015 federal election and was sworn into Prime Minister Justin Trudeau’s cabinet as defence minister on November 4, 2015.